My familiarity with the French dish known as the Croque-Monsieur Sandwich originated with an American version called the Monte Cristo Sandwich. You see, I first experienced the latter during a visit to the Disneyland Resort about a decade ago. It took another four or five years before I first stumbled across the Croque-Monsieur at a cafe in downtown Los Angeles. The Croque-Monsieur Sandwich is originally a popular dish served at cafes and smaller eateries in Paris, France. Basically, it is a ham and cheese sandwich that is either baked or fried. The sandwich was originally created for the French working-class. At least two origin stories are associated with the Croque-Monsieur Sandwich. The first origin tale claimed that the sandwich was created entirely by accident when French workers left their lunch pails too close to a hot radiator. The heat toasted the bread and melted the cheese in their sandwich. Personally, this origin tale seems a bit far-fetched and no particular date or year is associated with this tale. The second version seemed to have more merit. In 1901, a chef at a local Parisian brasserie on the Boulevard des Capucines had ran out of baguettes for the restaurant’s sandwich of the day. The chef cut slices from a loaf of Pain de Mie bread (similar to American sandwich bread) placed ham and cheese between them and baked the entire sandwich until it was crisp. The name of the sandwich came from the French verb croquer (“to bite”) and from a casual comment from the chef, when asked about the ham’s origin. The chef pointed at another customer and claimed that the ham came from “C’est la viande de monsieur (It’s that guy’s meat)”. The sandwich first appeared on the menu of a Parisian cafe in 1910. Unfortunately, no one seems to know which cafe. It was also mentioned in the second volume of Marcel Proust’s novel, “In Search of Lost Time”, in 1918. 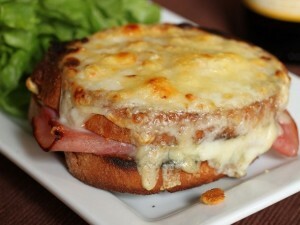 Over the years, variations of the Croque-Monsieur Sandwich had been added. Some brasseries and cafes eventually added Béchamel sauce. A Croque-Monsieur Sandwich with a poached or lightly fried egg became known as Croque-Madame. In the United States, a ham and cheese sandwich dipped in an egg batter and deep fried was called the Monte Cristo Sandwich. And in Great Britain, a hot ham and cheese sandwich became known as a “toastie”. In all my years of reading about the men and women who worked at NASA, whether in the air or on the ground, I have only come across two people who people of color. And both were astronauts. Not once did those articles ever reveal the numerous African-Americans who worked at NASA – including those women who worked as mathematicians (Human Computers) for NASA during the Space Race between the 1950s and 1970s. Imagine my surprise when I first learned that 20th Century Fox Studios planned to distribute a movie based upon the 2016 non-fiction book, “Hidden Figures”. Written by Margot Lee Shetterly, the book focused on three NASA mathematicians – Katherine Johnson, Dorothy Vaughan, and Mary Jackson. 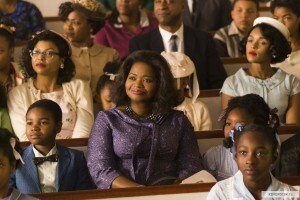 Even before the movie was finally released, a NBC series called “TIMELESS” aired an episode set during the Apollo 11 mission that featured one of the movie’s main characters – Katherine Johnson. In the midst of all of this, I found myself anticipating the movie. As I had stated earlier, “HIDDEN FIGURES” began in early 1961 in which mathematicians Katherine Johnson and Dorothy Vaughn, along with aspiring engineer Mary Jackson; are working at NASA’s West Area Computers division of Langley Research Center in Hampton, Virginia with minimum satisfaction. Dorothy, who works as an unofficial supervisor of the black women who served as Human Computers, requests to be officially promoted to supervisor. Her request is rejected by her supervisor, Vivian Mitchell. Mary identifies a flaw in the experimental space capsule’s heat shields. Space engineer Karl Zielinski encourages her to aggressively pursue a degree in engineering for a more substantial position at NASA. In order to attain a graduate degree in engineering, Mary would have to take the required courses in math and physics from a University of Virginia night program being taught at the all-white Hampton High School. After the Soviet Union manages to send a successful Russian satellite launch, pressure to send American astronauts into space increases. Vivian Mitchell assigns Katherine to assist Director Al Harrison’s Space Task Group, due to her skills in analytic geometry. Katherine becomes the first African-American woman to work with the team and in the building. But her new colleagues are initially dismissive of her presence on the team, especially Paul Stafford, the Group’s head engineer. 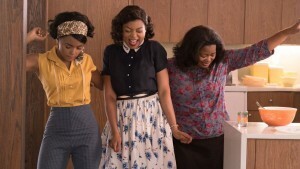 The movie focuses on the three women’s efforts to overcome bigoted attitudes and institutional racism to achieve their goals at NASA. “HIDDEN FIGURES”, like any other historical drama I have ever seen or read, is mixture of fact and fiction. Some of the movie’s characters are fictional. And Allison Schroeder and director Theodore Melfi may have mixed up the dates on some of the film’s events. But as far as I am concerned, this did not harm the movie. More importantly, Schroeder and Melfi created a screenplay that maintained my interest in a way that some films with a similar topic have failed to do. In other words, “HIDDEN FIGURES” proved to be a subtle, yet captivating movie. 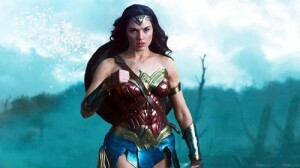 The movie’s subtle tone manifested in the racism encountered by the three women. Katherine Johnson dealt with the Space Task Group’s quiet refusal to take her seriously via minor pranks and dismissive attitudes. She also has to deal with Paul Stafford’s constant stream of complaints, skeptical comments and attempts to take credit for her work. Worst of all, Katherine is forced to walk (or run) several miles back to her old building in order to use the restroom, due to the Space Task Group’s restrooms being off-limits to non-whites. Dorothy Vaughn is determined to become the official supervisor for the segregated West Area human computers. But due to her race, her supervisor – Vivian Mitchell – refuses to consider giving Dorothy a genuine promotion. The most subtle example of racism found in the movie manifested in Mary Jackson’s desire to return to school and attain a graduate degree in engineering. The racism she faced seemed to be internal. Despite urgings from both her husband and Mr. Zielinski, Mary seemed reluctant to request permission from the Virginia courts to attend a segregated school in order to obtain a graduate Engineering degree. Subconsciously, she seemed to believe that her efforts would be wasted. The fascinating thing about the racism that the three women faced is that violence of any kind was not involved. 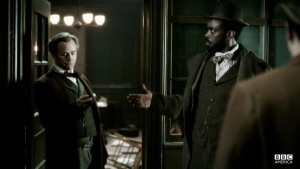 The racism that they faced was subtle, insidious and nearly soul-crushing. But no violence was involved. The closest they came to encountering violence occurred when a law officer stopped to question them, while Dorothy’s car was stranded at the side of the road in the movie’s opening scene. The cop eventually escorted them to the Langley Research Center after learning they worked for NASA. Yet, I could not help but feel that the entire scene seemed to crackle with both humor, intimidation and a little terror, thanks to Theodore Melfi’s direction. Despite my admiration of Melfi’s direction of the above-mentioned scene, I have to admit that I would not regard it as one of the best things about “HIDDEN FIGURES”. 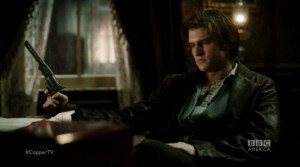 I am not stating that I found his direction lousy or mediocre. If I must be honest, I thought it was pretty solid, aside from that opening scene, which I found exceptional. “HIDDEN FIGURES”was his third feature-length film as a director . . . and it showed. 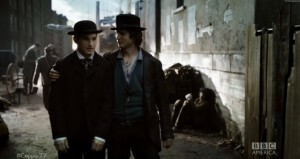 I suspect that the movie benefited more from its subject matter, screenplay and its cast. Only one cast member from “HIDDEN FIGURES” had received any acting nominations. Octavia Spencer received both an Academy Award nomination and Golden Globe nomination for Best Supporting Actress. Personally, she deserved it. I thought Spencer gave a very subtle, yet commanding performance as the group’s aspiring supervisor, Dorothy Vaughn. I was also impressed by Janelle Monáe, who not only gave a very entertaining performance as the extroverted and witty Mary Jackson, but also did an impressive job in conveying her character’s self-doubts about pursuing an Engineering graduate’s degree. I am surprised that Taraji P. Henson did not received any major acting nominations for her performance as NASA mathematician Katherine Goble (later Johnson). Personally, I find that baffling. I was very impressed by her quiet and subtle performance as the widowed mathematician, who not only struggled to endure the dismissive attitude of her Space Group Task Force colleagues, but also found love again after spending a few years as a widow. Personally, I thought Henson’s performance deserved at least an award nomination or two. “HIDDEN FIGURES” also featured top notch performances from the supporting cast. Kevin Costner gave a very colorful performances as the Space Group Task Force director Al Harrison. The movie’s other colorful performance came from Glen Powell, who portrayed astronaut and future U.S. senator John Glennn. Jim Parsons was just as subtle as Henson in his portrayal of the racist, yet insecure head engineer Paul Stafford. Mahershala Ali gave a nice and charming performance as Katherine’s second husband, Jim Johnson. But his performance did not strike as particularly memorable. 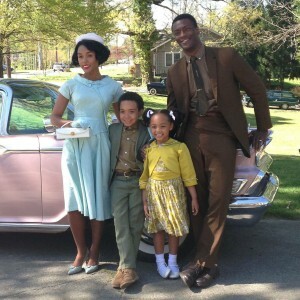 Aldis Hodge, on the other hand, gave an intense and interesting performance as Mary’s politically-inclined husband, Levi Jackson; who urges his wife to overcome her reluctance to pursue a graduate degree in Engineering. This movie seemed to be filled with subtle performance for Kirsten Dunst also gave one as the slightly racist Vivian Mitchell, supervisor of all the Human Computers. The movie turned out to be quite a surprise for me. Watching the trailer, I came away with the impression that it would be one of those nice, but mediocre live-action Disney films. And to be honest, there were moments when Theodore Melfi’s direction gave that impression. He does not strike me as a particularly memorable director. But that opening sequence featuring the three protagonists and a cop seemed to hint Melfi’s potential to become a first-rate director. In the end, the movie’s superb Oscar-nominated screenplay and the excellent performances of a cast led by Taraji P. Henson, Octavia Spencer and Janelle Monáe made “HIDDEN FIGURES” one of my favorite movies of 2016. 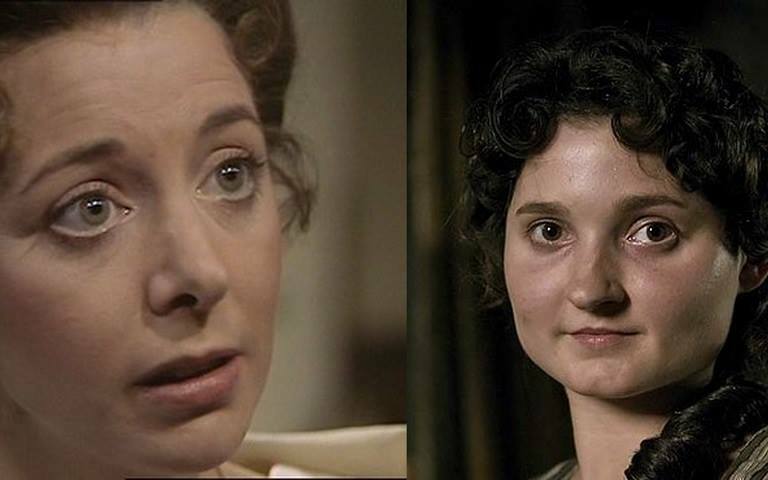 In Winston Graham’s 1953 novel, “WARLEGGAN: A NOVEL OF CORNWALL, 1792-1793”, Verity Poldark Blamey had attended the wedding of her widowed sister-in-law, Elizabeth Chynoweth Poldark, to banker, George Warleggan. Four years earlier, Verity had married a middle-class sea captain named Andrew Blamey. Despite her marriage, despite her declaration that she had nothing against the Warleggan family because they were noveau riche, despite her revelation that many aristocratic families had originated as successful traders and the fact that she was writing to her cousin-in-law, who had been born into the working-class . . . I now realize that Verity was a snob . . . despite all of the above. How disappointing. And yet, I am not surprised. I see that in some ways, she is a lot like her cousin Ross Poldark.